The actual name of this dish translates to “Chicken in Fish-Fragrant Sauce,” but you will likely never see it on an American Chinese restaurant menu as such, for obvious reasons. That just doesn’t sound appetizing to the American imagination. The sauce does not smell of fish–and there is no fish in it–it is simply a sauce that is traditionally used by cooks in Sichuan to give fish a delicious aroma. The rich coffee-colored sauce is sweet and sour, spicy and garlicky, and is filled with the fragrance of fresh ginger, scallions, soy sauce and sesame oil. While it is traditionally used for fish, in most American restaurants that serve the foods of Sichuan province, this sauce, granted the more palatable, if inadequately descriptive moniker “Garlic Sauce,” is most often paired with shredded chicken, pork, beef or halved shrimp. I have also had it with fresh scallops–a truly decadent combination which I want to cook in my own kitchen sometime when Morganna is out for dinner, since she does not much care for scallops. The only other traditional main ingredient besides the poultry, meat or seafood are water chestnuts and wood ear mushrooms. I was out of wood ears, which are just there for the contrasting color and wonderful squeaky-crunchy texture. 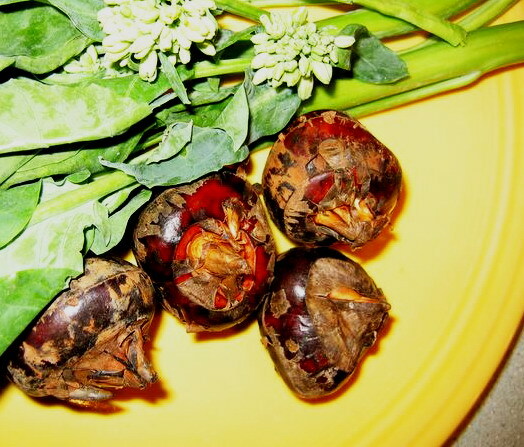 but I had managed to pick up crisp, sweet and juicy fresh water chestnuts at the Columbus Asian Market the last time we were there. Fresh water chestnuts are where its at for this dish. Even though I had only ever eaten it with canned water chestnuts before when I first fell in love with the dish back in Huntington, West Virginia at the China Garden Restaurant, once I made it myself with the fresh ones–there was no going back. The difference in flavor is just astounding–the intense sugary hit of the crisp little slivers of water chestnut contrast perfectly with the buttery tender chicken, and combine with the zingy sauce to make a divine cacophony of flavor and texture in the mouth. They are quite simply incomparable and are well worth seeking out. If you cannot find them, try fresh jicama root–it has the exact same crunch and is almost as sweet as a fresh water chestnut, but with a bit of a musky starchiness in addition to the sugar. This dish is the very first real Chinese recipe I ever learned, you know. It is true–I learned it from one of the under-chefs who worked for the chef-owner of the China Garden, Huy. The chef’s name was Lo, and he loved me dearly, and would teach me various things about Chinese food. He said I reminded him of his granddaughter back home and he was always making dim sum treats for us all for breakfast and lunch, and he would tell me how to make them. He was thrilled when he gave me my first taste of turnip cake, because I fell in love with it, and he showed me how to make it, and would fry me up a slice in the morning when I came to work. The recipe everyone in town wanted, however, was the one for Huy’s Chicken with Garlic Sauce. When he put that on the lunch menu, people would line up around the block to get in and get a plate of it for the special low lunch price. They were crazy for it, and with good reason–it was excellent, and a great lunch value. I don’t know how many customers begged me to find out how to make it. They offered me money if I could get the recipe. Which is good, because Huy would never let me see what he was up to when he cooked it. He knew I could cook, and he knew I was curious and smart, so when he would cook it, he would stand just so in front of the wok so I couldn’t see what he was doing. It frustrated me greatly, but the two of us made a joke of it. And what was funny, was some days Lo would make the dish, and it never tasted quite as good as the way Huy made it. Lo knew it, too, but Huy would not show him how he made it. I practiced the recipe, and soon, I could make Lo’s version. I never gave the recipe away, though, because I didn’t want to share even part of Huy’s secret. Years later, I bought some chiangking vinegar–Chinese black vinegar, which tastes similar to balsamic vinegar–for another recipe. And when I tasted it, I was suddenly transported to the loud, hot clamor of Huy’s kitchen. That was it! He put black vinegar in his version of chicken with garlic sauce! I was right, but only partially so. When I made it with only the black vinegar, it tasted flat–it was almost right, but not quite. I realized that the secret that Huy had and kept from us all was that he used half regular white rice vinegar and half black vinegar. The first time I made it that way, Zak took a bite and his eyes jolted open. Indeed it was. I had finally hacked the secret of the sauce that I swore I would eat most anything, including dog poop, if only Huy cooked it in that sauce. I was proud of myself, but I just cooked it for friends and family, because I didn’t want to steal Sifu Huy’s secret. So, I kept it to myself for years and years until I heard that Huy had retired and closed his restaurant. Then, I taught it to some of my cooking students, and now, I am sharing it with the rest of the world via my blog. Here it is, in all of its simple glory. It is really great served with a simple stir fried dish of greens on the side with plain steamed rice, of course. 1 lb boneless skinless chicken breasts, cut into 1″ long thin strips. 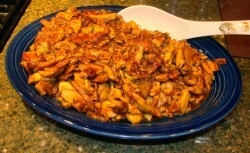 Marinate chicken with wine, cornstarch and black pepper while cutting vegetables. 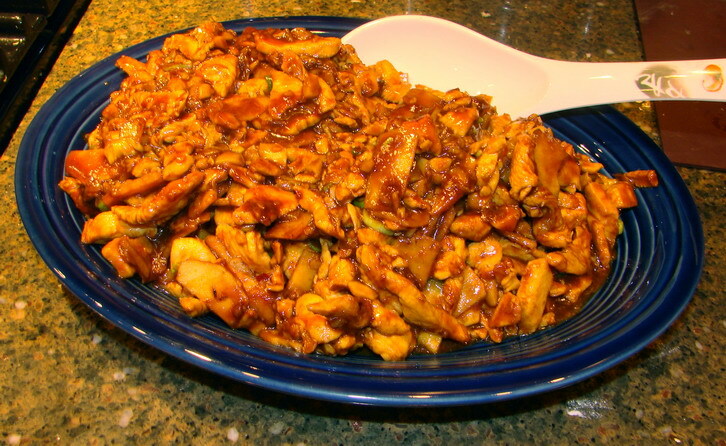 Mix together sauce ingredients: vinegars, soy sauce, wine, sugar, chili garlic paste and sesame oil. Set aside. Slice water chestnuts into shreds, about three pieces per slice. Trim any woody parts from the fungus and discard. Roll up fungus into a cigar shape and thinly slice crosswise to make thin ribbon-like shreds. Heat wok on high heat until it is about to start smoking, add oil and heat until it shimmers, then stir fry garlic, ginger and white part of scallion together for thirty seconds. Add drained chicken, and pat into a layer on the bottom of the wok. Allow chicken to brown lightly by sitting undisturbed on the wok for 45-60 seconds. Stir and fry until chicken is nearly done. Add water chestnuts, fungus and sauce ingredients. Bring sauce to a boil. Add cornstarch and water, boil until thickened and glossy. Remove from heat and garnish with green scallion tops. What a great story…thanks for sharing it and the recipe! Heyyy it looks really scipy and tatsty.Mouth wateringgggg..Thanks for sharing. Thanks for sharing the recipe! I’m going to make it tomorrow for dinner. I just came back from visiting my Mom and she’s taught me so many recipes….too many recipes, not enough dinners to cook for! This recipe looks heavenly. Do you think balsamic vinegar would be an acceptable substitution if I can’t find black rice vinegar? What a treasure! Both the story and the recipe. I hope I get the opportunity to make this sometime, and when I do, you cna bet that I will have an image of two proud little men behind a lunch counter. Thank you. My husband LUVS this dish with variations like shredded pork thrown in…After reading ur post, I have no reason to not try it at home! I am glad folks enjoyed the story. I miss both Huy and Lo immensely. I learned a great deal from them, whether they were teaching me or not–just watching them cook was an education in and of itself. Jaden–there are never too many recipes! I hope you like cooking this one–let me know what you think of it. Aimee–in a pinch, balsamic will do nicely. It isn’t perfect, but it is very close. Erika–to help with the picture, Lo was tall and thin, with a very peaceful, high-cheekboned face and a hawk’s nose. Huy was short and round, with a very round face and an amazing big-toothed smile, with wonderfully mobile eyebrows. He had a great laugh, too. Lo was much more quiet than Huy. Dhana–once you get the sauce right, it is all easy. Where is the Asian market in Columbus? We went to a couple of Asian markets here in Indy with no luck finding black vinegar, and since I’ll be coming through Columbus in a couple of weeks on the way home from Cleveland, I thought I might have better luck there. Thanks! I have to admit that mid-story I had to scroll down to see whether you’d be giving the recipe or not. Whew! It was a relief to see that you had. Thanks for sharing! Can you suggest a substitution if I can’t find the fungus? I think I have all the other ingredients except for it and the water chestnuts, which I think I can find. I’d like to try this soon (but I’ll use tofu instead of chicken). Lucy, on Bethel Road in Columbus, is Columbus Asian Market, also known as CAM. That is where I do a lot of my shopping when I am in the city. You will find black vinegar there for certain. SusanV–the fungus has no flavor at all; it is what the Chinese call a “texture food.” Like jellyfish, it is “squeaky-crunchy” though jellyfish is squeakier. If you cannot find cloud ear or tree ear fungus, just leave it out. If you have the water chestnuts, you will be fine. The Shao Hsing wine is mentioned twice. Was that a typo or is the extra 1 tbsp reserved for something? No, Mike, it isn’t a typo. If you read the method steps closely, you will see that the first measure of the wine is for the marinade, and the second one is mixed into the sauce ingredients. I thought I may have left out a step–I have been known to do that in the past, but it is also easy to miss when you read the recipe quickly. Thanks for pointing it out, though, because sometimes I do leave a typo in and helpful readers point them out to me and help me fix it. thanks for this recipe .. i had a first attempt today with a few tiger prawns and scaled down the ingredients to 1/4 but it wasnt a result that people would queue around the block for lol ..i did like the taste of the black and rice wine vinegar though and will try that combination in some of my other recipes. Barbara, thanks so much for sharing this treasure. I absolutely can’t wait to try it. Years ago, I was a devotee of this dish in a couple of different Chinese restaurants. But somehow, everyone in NYC forgot how to cook this dish and began making a sort of sickly, sticky-sweet sauce and called it “garlic sauce”. Nowhere could I find the sauce I loved — and I have a strong sense that this is the sauce. I’m looking forward to it! This looks like a fantastic recipe – can’t go wrong with garlic sauce! Thanks for sharing! Paul–it is also known as chile garlic sauce–the brand I use most often is Oriental Mascot, which is both hot and tangy–kind of sour. If I cannot get that, I will use Lee Kum Kee–but it is sweeter and not as hot, so I don’t like it as well. You can make this dish considerably hotter with more of the chile garlic sauce without mucking up the flavor balance. This recipe has a pretty conservative amount of heat in it–but I have found that if you like more zing–add a teaspoon or so more of the chile garlic and let ‘er rip. That may be the taste your tongue is looking for to push it over into la la land. Oh, and the reason why people lined up around the corner and down the block for this probably has to do with the fact that this restaurant had probably the spiciest, most unusually flavored food in the entire city. It was West Virginia, after all, so people didn’t have the most cosmopolitan of tastebuds. Though, once, a tourist from Manhattan came in–he was on a train trip to view fall foliage, and he was amazed at the authenticity of the Sichuan food in a place in West Virginia. So, yeah, the food was pretty fantastic. Keep playing with it and make it your own. Julie–good luck and I hope you have found the sauce of your dreams. You are welcome Su Lin. The chicken with garlic sauce recipe looks very good, except for the fact that it ask for 1 tbsp of ground pepper. It seems a bit much for 1 lb. of chicken, is that a typo or is that accurate? Yes, that is the measurement. If that seems to be too much to you, add less–add it to your taste, in other words. The same would go for the chile garlic paste as well. Hot flavors are always to taste, as far as I am concerned. I can take a lot of heat, as can most of my family, but not everyone is that way. I made this and man oh man it was delicious. I loved the story, and I thought of it while cooking this dish. Quick question about the wine. You can get Chinese “Cooking” wine for incredibly cheap, but obviously there’s a lot of salt in it (this is what makes it cheaper…you don’t have to pay any of the tariffs associated with importing wine). I’m wondering if it’s possible to use the saltier wine with a modification to the other ingredients, or if it’s a better bet to just use dry sherry. Thanks, your site is very interesting! Dry sherry is better than salted Shao Hsing, Jordan. Glad you are enjoying my site! I just found your site and i love it. I stumbled across it googling pho (my latest obsession) a couple of weeks ago, and have been back dozens of times since. I had rather an adventure purchasing and seasoning my new wok, and your post was quite helpful. This is the third of your recipes I’m trying–the first two were great successes–and I’m wondering about how you prepare your fresh water chestnuts. I noticed that there was an asterisk after their mention in the recipe, and was wondering if you had some special method of preparing them. I’ve searched your site to no avail. After my first unsuccessful attempt to peel them raw, i decided to blanch the rest of them. It made them a little bit easier to peel, but still, it wasn’t a picnic. I was wondering if you had any suggestions that might make preparing fresh water chestnuts any easier. What do you do to them? I know you’re a huge fan and I’d like to try them in their fresh form, as I’ve only ever had them canned. Any tips would be much appreciated. I tried out this recipe tonight and the variety of flavors is great! At once very peppery, sour, savory and sweet with just a touch of heat at the end. I wasn’t able to make much wok-hay with this dish since my gas stove doesn’t make the wok hot enough but my girlfriend and I still loved it. Keep the great Chinese recipes coming Barbara! Years later, I finally, finally got around to trying this recipe. It is amazing! Thank you again for sharing it! That much black pepper really adds in a lot of heat on its own, too. Yum! Thanks so much for posting this recipe! My husband and I loved it and he says it is now one of his favorite meals. I made this with Vegan Morningstar Chick’n Strips. I am even making this for my MIL for her birthday. Thanks for sharing this recipe, my husband and I really enjoyed it and he says this is one of his favorite recipes. I made this with Morningstar Vegan Chick’n Strips and it was delicious! I put a picture of it up on my blog if you would like to see it. I am even making this for my MIL’s birthday. Thanks again!